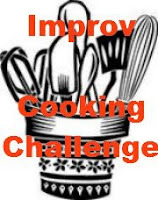 It's time for another Improv Challenge! 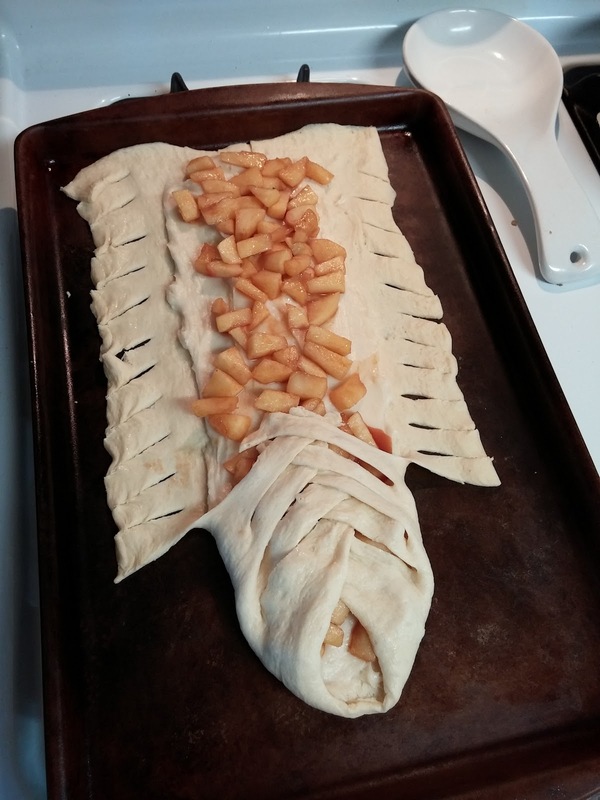 This month's assigned ingredients were apples and cinnamon. Classic combo! And great for this time of year. I didn't spend too much time deciding what to make this month. I have been pretty busy, so when I saw this recipe at Lauren's Latest, I decided it would be perfect. 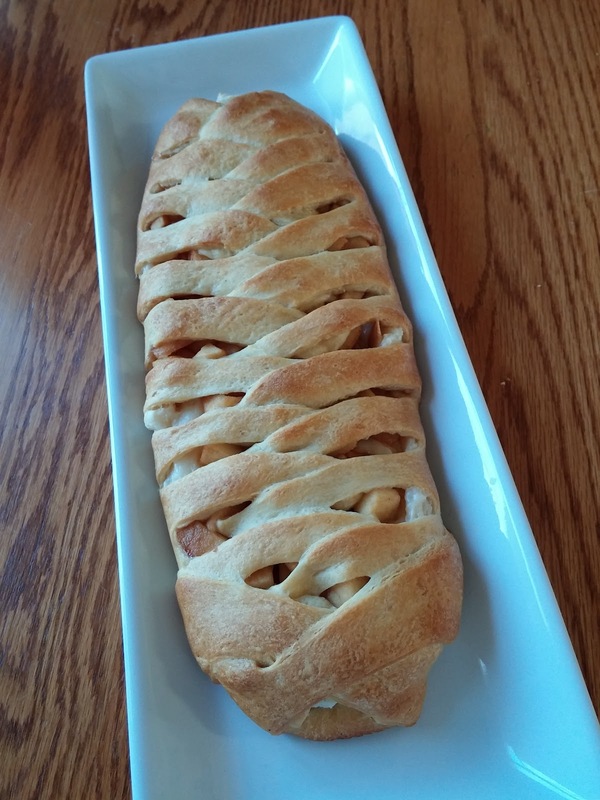 My husband leads a monthly study on the Lutheran Confessions (kind of like a Bible study) and my contribution to it is a yummy baked goody for the participants to nosh on during the discussion. It's a morning event, so I usually do a coffeecake or muffins, but when I saw this danish I knew it would be perfect. 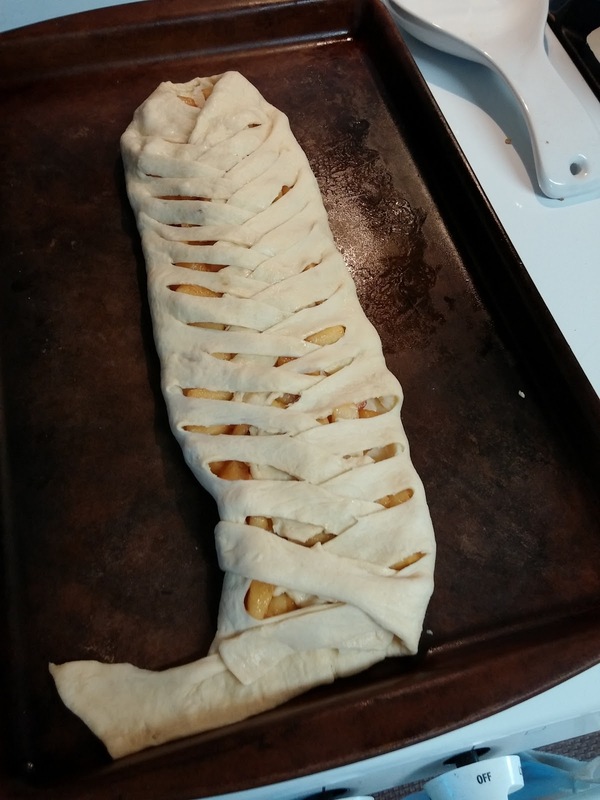 I loved how it called for crescent rolls. Easy peasy; my kind of baking! Melt butter in a medium skillet over medium-low heat. 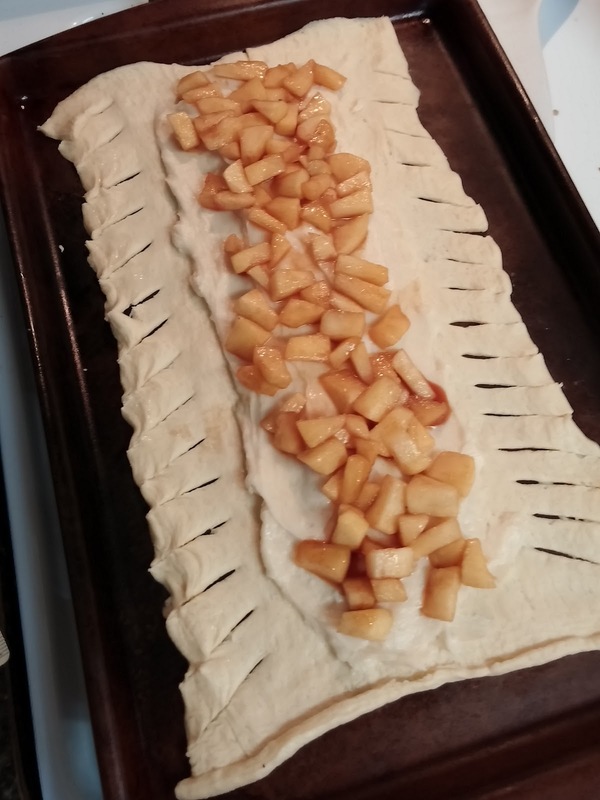 Add apple, cinnamon, and 2 tbsp white sugar. Cook, stirring occasionally, until apples have softened, about 10 minutes. Remove from heat and set aside. In a medium bowl, combine softened cream cheese, remaining ½ cup white sugar, and 1 tsp vanilla. Stir in flour. Set aside. 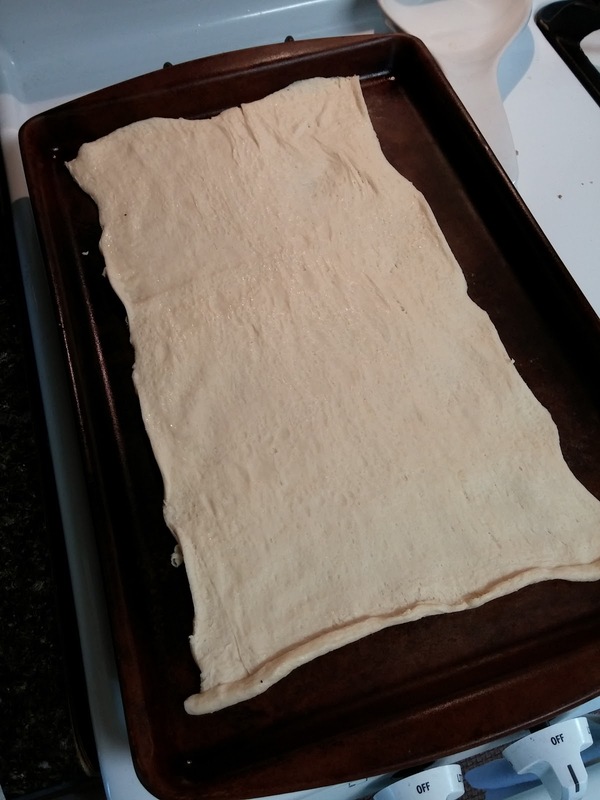 Unroll crescent roll sheet on a baking sheet. Using a paring knife, cut diagonal slits along the left and right edges, about 1 inch apart and 2 inches long. 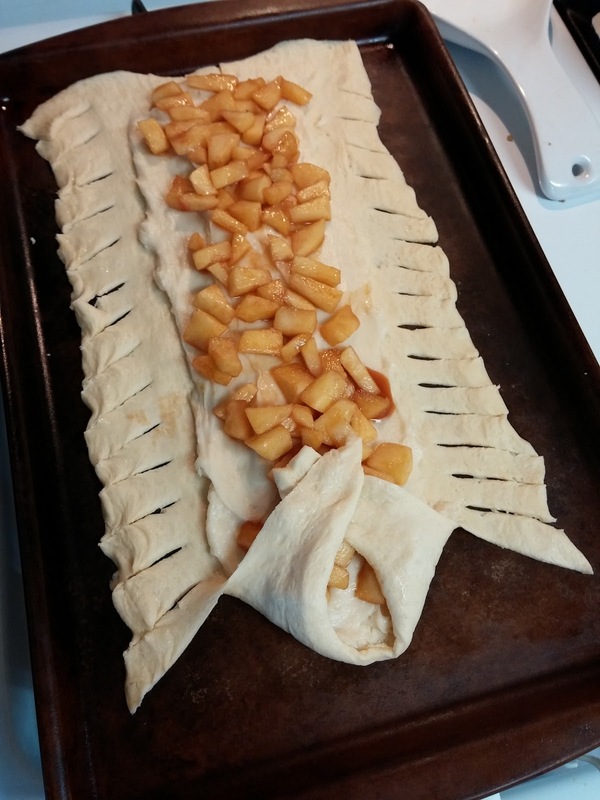 Spread cream cheese mixture down the middle of the dough and top with the apples. 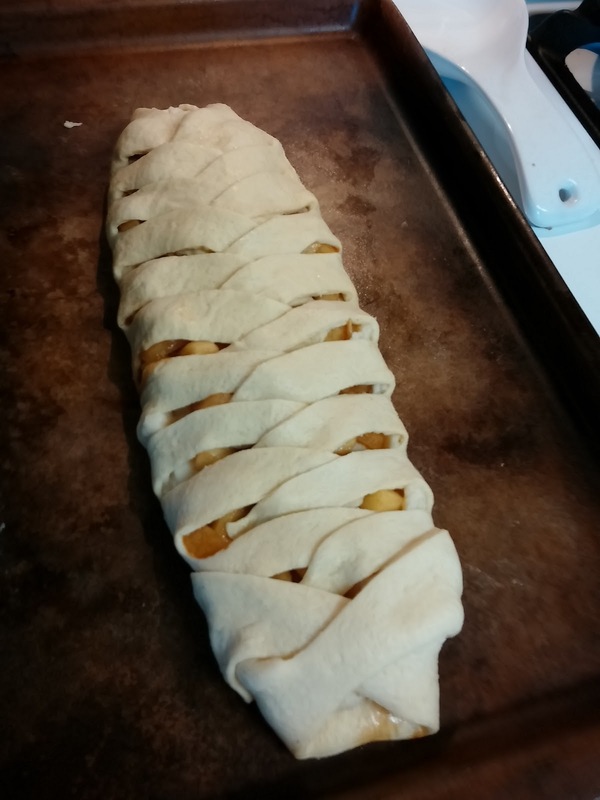 Starting at one end, fold the diagonal dough strips over the top of the apples, alternating sides to make a criss-cross pattern. When you get to the end, tuck the last pieces underneath. Bake for 18-20 minutes, or until golden brown. Remove from oven and let cool. While it’s cooling, make the glaze. Combine the powdered sugar, heavy cream, and remaining ¼ tsp vanilla. 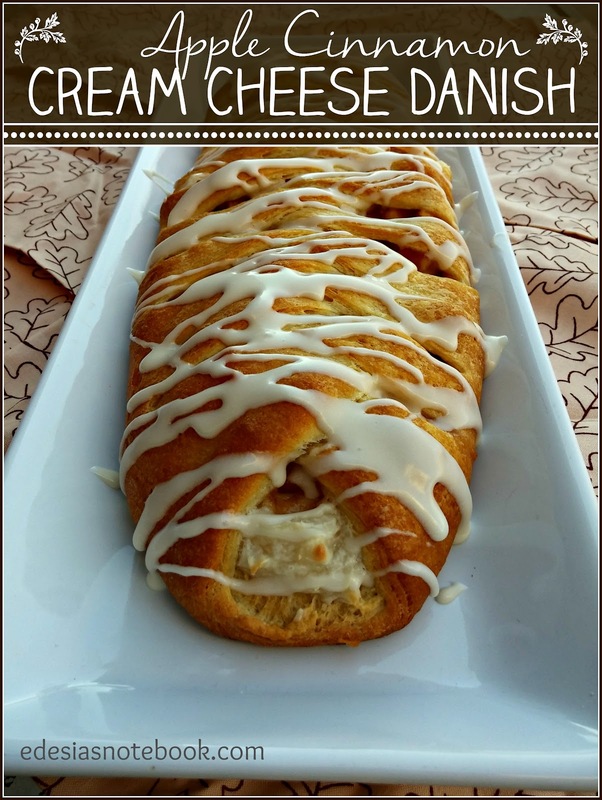 When danish is cool, drizzle the glaze over the top. 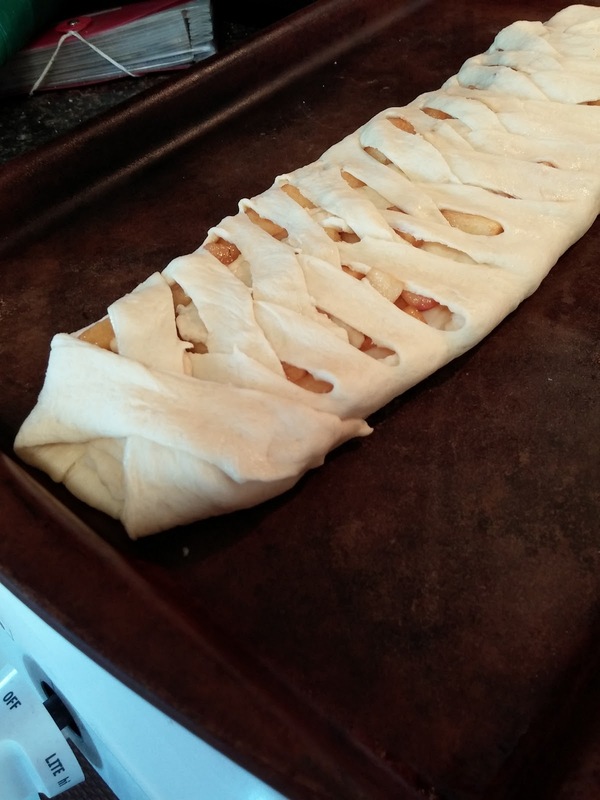 Instead of regular crescent roll dough, I used the crescent roll sheets. I can't believe these haven't caught on yet! 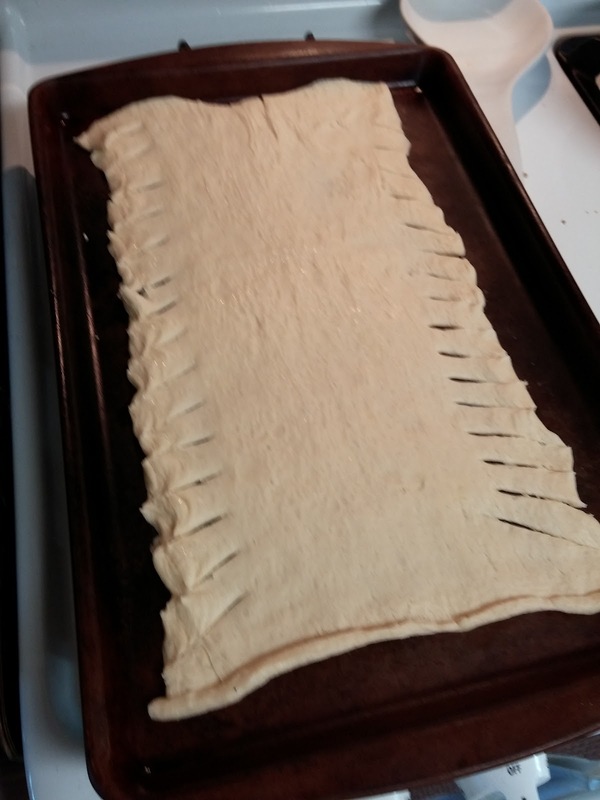 It's just like the regular crescent roll dough but without the perforations. 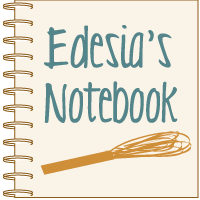 So all those recipes that have you pinching the seams together? Ain't nobody got time for that! Use the sheets! 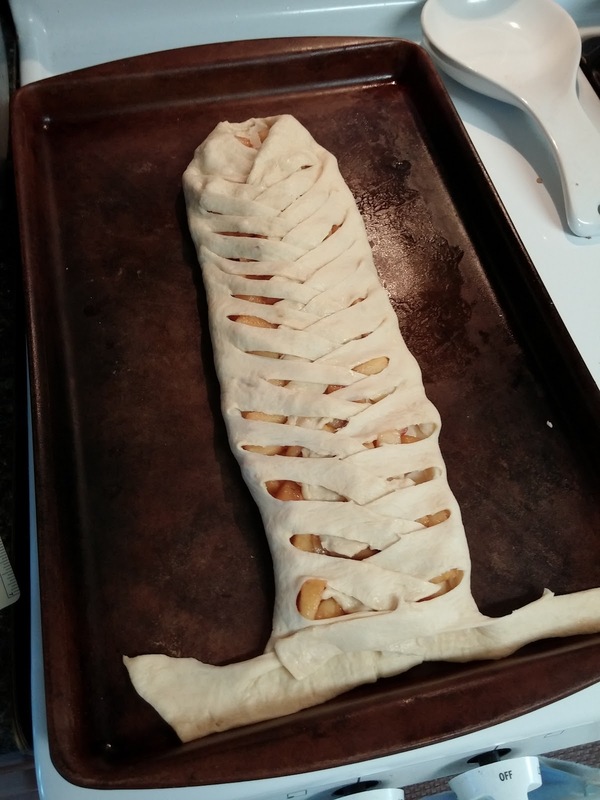 They are right with the regular crescent rolls. Cutting the strips. 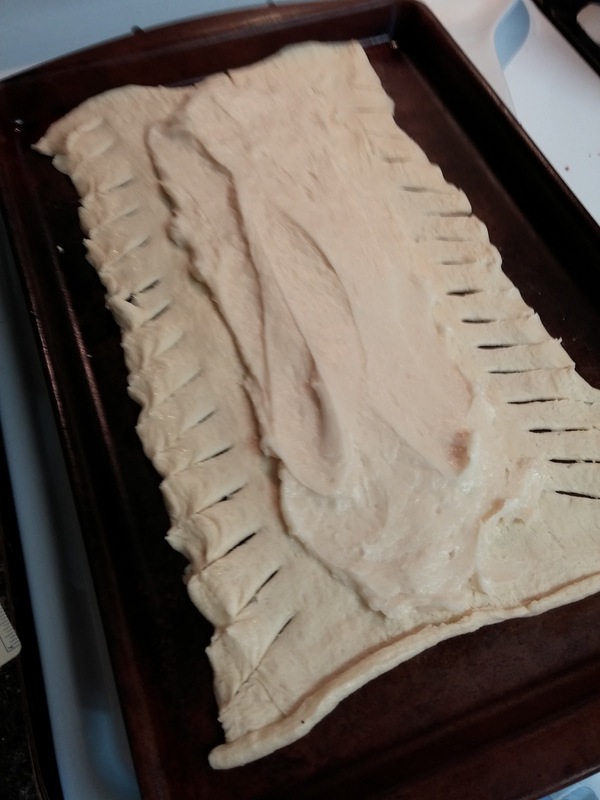 The original recipe called for cutting them every 1/2", and I did this first one that way. I thought the strips were a little too skinny, so on the second one I did 1" instead. I liked that a lot better. But this gives you an idea of how it should look. Smear on the cream cheese mixture. Left side, right side, left side, right side. . . When you get to the end (I had turned my baking sheet around for easier access). . .
. . . fold the last pieces over. . .
. . . and tuck them underneath. Like it's hugging itself! Wrapped up like a mummy and ready for the oven! This is the second one with the wider strips. Prettier, I think. Our of the oven and ready to be glazed. Isn't it lovely? I have to tell you; the morning I was supposed to make this (I actually made two), I woke up with a stiff neck. Could hardly move my neck at all without excruciating pain. Oh man! I hate it when that happens. I was up early with the kiddos and I just wanted to sit and relax and try to work this neck thing out. But I couldn't. I had to make these danishes. I am so glad I picked such an easy recipe to make! Even with a stiff neck, I had these babies done, baked, glazed, and ready for my husband to take out the door in less than an hour. But they still had that "wow" factor that I love. It was such a hit that the only bit left after the study was a little end piece for me to try. Yummy. I would have loved to have gotten a pic of it sliced for you, but it didn't happen. Sorry! The great thing about this is you can easily change up the fruit. I think any kind of fruity pie filling would be good. You could also use lemon curd or apricot jam, or any number of other things instead of the apples. So if you need an easy breakfast or dessert treat that will really "wow" people with minimal effort, this recipe is for you! 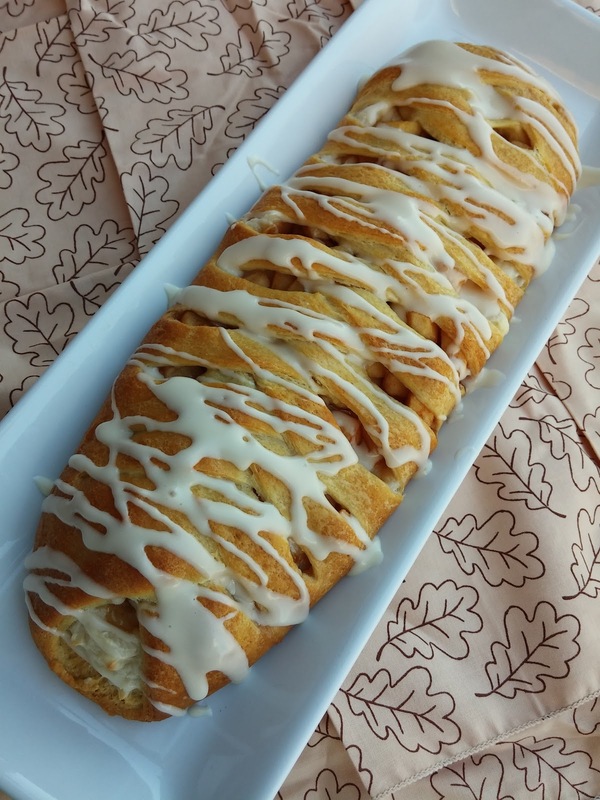 Be sure to check out all the other awesome apple and cinnamon recipes below and come back next month to see what kind of "red and green" thing I come up with! Thanks for this beautiful tutorial and delicious recipe. Beautiful danish! It looks like an amazing breakfast! This looks beautiful. And I can just imagine how good it tastes. Going to have to try this one too. how beautiful! This would be great for a busy Christmas morning!